While tech companies continue to push the boundaries on voice-assisted technology, the most frequent users of devices like the Amazon Echo and Google Home want them to perform mundane ongoing tasks like browsing the internet or answering texts, Morning Consult polling shows. Tech companies are starting to realize how much that convenience matters to its potential customers, and aim to make sure their devices can excel at the most basic functions. For instance, Samsung sees people using its upcoming Bixby assistant “for simple tasks like a timer, an extension of search” and where “the next movie is showing, or general Q&A,” VentureBeat reported. 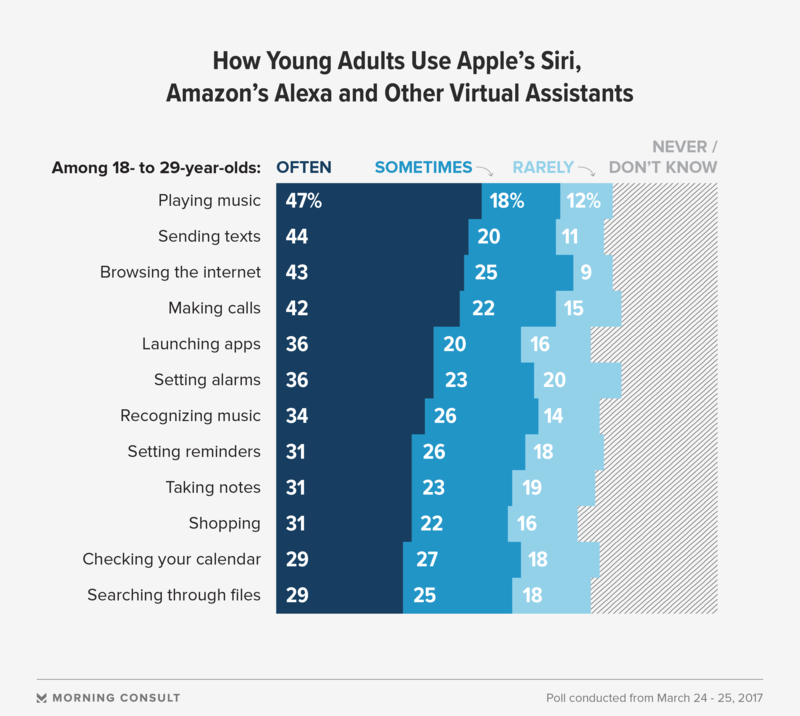 Apple’s Siri feature, the oldest virtual assistant in existence, is the most widely used device among millennials and Generation X, according to a recent Morning Consult survey. More than a third (38 percent) of people aged 18 to 29 as well 35 percent of 30- to 44-year-olds said they use Siri at least once a week. Not far behind is the Google Assistant, as 30 percent of people aged 18 to 29 and and 31 percent of Generation X say they use that device at least once a week. Windows’ Cortana and Amazon’s Alexa are less popular among younger Americans. The ability to play music is the most popular feature of virtual assistants among young adults: 47 percent of 18- to 29-year-olds say they use their assistant for that feature. In second place is surfing the web, with 43 percent of respondents age 18 to 29 and about half of 30- to 44-year-olds using their virtual assistants for that feature. Other top features for young people include basic smartphone tasks like making calls, sending texts and launching apps. Less popular are virtual assists for setting reminders or checking calendars, with only about a third of people 18 to 29 using those features. People age 30 to 44 outpace their younger counterparts in this category, with 35 percent of people in that age group turning to their virtual help for reminders or calendars. Polling was conducted among 2,201 adults from March 24 through March 25. See full results.